This Saturday, a small drone carrying the abortion-inducing pills mifepristone and misoprostol will fly from Germany to a border town in Poland. And yes, “Abortion Drone” sounds like the name of an anarchist punk band, but this is the most badass drone aid mission yet. 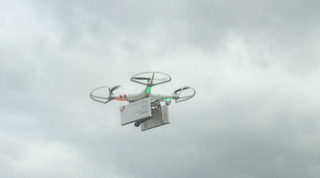 The drone will deliver medication to reproductive health groups, who will distribute the pills to people who want to terminate their pregnancies and can’t access abortion legally. Abortion is heavily restricted in Poland, and the drone project is a collaboration between Women on Waves and a few other reproductive health and women’s activist groups. Women on Waves doesn’t need authorization from Germany or Poland to fly the abortion drone because it’s under five pounds, won’t be used commercially, and the pilot will be able to see it during the short border flight. Even though it’s illegal to take the pills in Poland, it’s not illegal to fly them in, providing a crucial loophole for helping people receive access to safe medicine. It’s a gimmick, but a worthwhile one. Part of the mission is raising awareness about Poland’s prohibitive reproductive health laws, but it’s also physically delivering medication to people who don’t have access. People are using drones as aid tools all over the world. South African rhino conservationists use them to scare poachers. In Malta, an American businessman uses drones to spot migrants being smuggled by human traffickers. There’s even a nonprofit called UAViators devoted to linking drone pilots with humanitarian missions, and another nonprofit called Syrian Airlift Project plans to use drones to sneak medical supplies in Syria. The Women on Waves abortion drone is different, though. Just calling it a humanitarian project downplays how contentious abortion is. Receiving the medication isn’t just a health care decision—it’s a political statement. With this mission, drones are becoming tools of political dissent.